Boko Haram reportedly kidnapped dozens more girls in Nigeria. 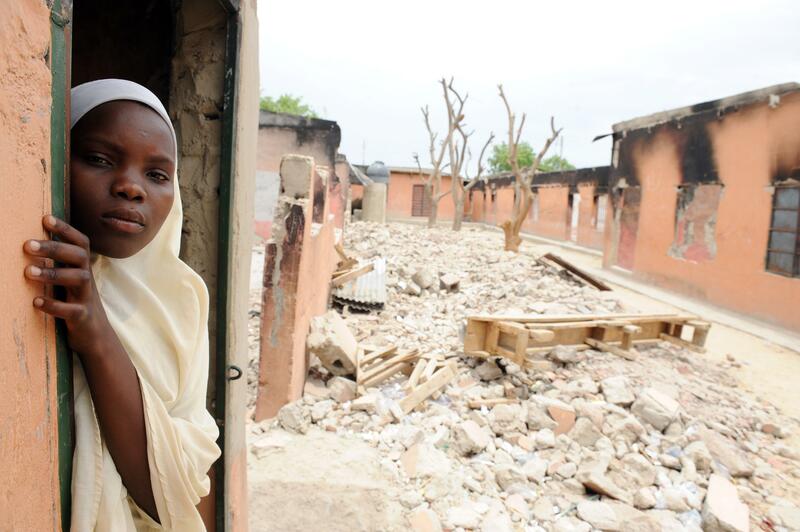 A female student stands in a classroom burned by Boko Haram. The Islamist militant group Boko Haram has conducted another mass kidnapping of dozens of women and girls in Nigeria, according to local residents. Nigerian officials have not confirmed the abductions in the northeastern region of the country, where the group has a stronghold. Local journalists, news reports, and a Catholic bishop in the area corroborated the attack took place over the weekend, according to the New York Times. The kidnappings took place last Saturday in a mountain village near the border with Cameroon, a Boko Haram stronghold, said Bishop Stephen Mamza, who is from the area but now officiates in the state capital, Yola. In the latest kidnapping, residents told the bishop that scores of gunmen on motorcycles stormed their village, Garta, on Saturday. Boko Haram has operated with near impunity for months in the mountainous region, with occasional reprisals from Nigeria’s military. The gunmen torched houses in the village, slit the throats of four men and went house-to-house searching for young women, eventually taking away around 60, according to the bishop and local news reports.